I have a new hero. His name is the late, great Gregory McDonald. There are some books that are giant, unrelenting tomes. You break your back carrying such books around and yet despite the voluminous number of pages, the story goes nowhere. Then there’s Fletch. In a little under 200 pages, McDonald, in his streamlined, use one word instead of ten, writing style manages to successfully provide the reader with a story about an anti-hero who solves not one but two complex mysteries. If you’re old enough to remember the Reagan administration, then you may have seen the Fletch movies by Chevy Chase – Fletch and the sequel, Fletch Lives. Both were funny and gave Chase his moment in the sun. Sadly, after reading the novel, I’ve realized that the movies were really only loosely based on McDonald’s work. The films served as a vehicle for Chase to show off his multiple character talents. For some reason, the epitome of the gold star for a comic is to star in a movie where he gets the chance to do various accents and pretend to be all different varieties of people. As movie Fletch, Chevy puts on all kinds of goofy costumes and buffoons his way through solving crimes while tricking people into giving information to the various personas he takes on. If you lived during the 80’s, you’ll remember Fletch. Also, Destro. The novel is a bit different. Make no mistake, on top of everything else, it is funny. But while the movies were zany funny, the novel could probably be described best as a dark comedy. The reader finds himself laughing at things that he probably should not laugh at in polite society. The plot? Fletch’s real name is Irwin Maurice, or I.M. (I am) Fletcher. He’s an LA based reporter posing undercover as a bum, trying to trick various beach dwelling hoodlums into helping him find the supplier of a constant flow of drugs to the beach scene for a story he’s writing. Stanwyck claims to have terminal cancer and offers Fletch $50,000 to return to a week and shoot him in his study. He tells Fletch this will allow him to avoid suffering through a prolonged, agonizing death and as it will appear like a burglary gone bad, his wife will obtain a hefty insurance payment. Fletch may be a degenerate (he is haunted by his two ex-wives’ divorce lawyers throughout the novel) but he’s no dummy. Refusing to take Stanwyck at his word, he sets out on an investigation to find out whether or not Stanwyck is telling the truth. By posing as various people (insurance investigators, lawyers, “old long lost friends,” etc.) he manages to trick the people in Stanwyck’s life to give up the dirt. In the process, he even discovers the source of drugs on the beach along the way. I really enjoyed this book. If you’ve seen the movie, you haven’t experienced the full story. It amazes me that in such a short novel, McDonald manages to provide the reader with a rich, in-depth experience. Rarely do I read a novel and want to read the series, but I think I might actually do it with this one. In case you are interested in the reading order for the Fletch novel series, I’ll post it below. 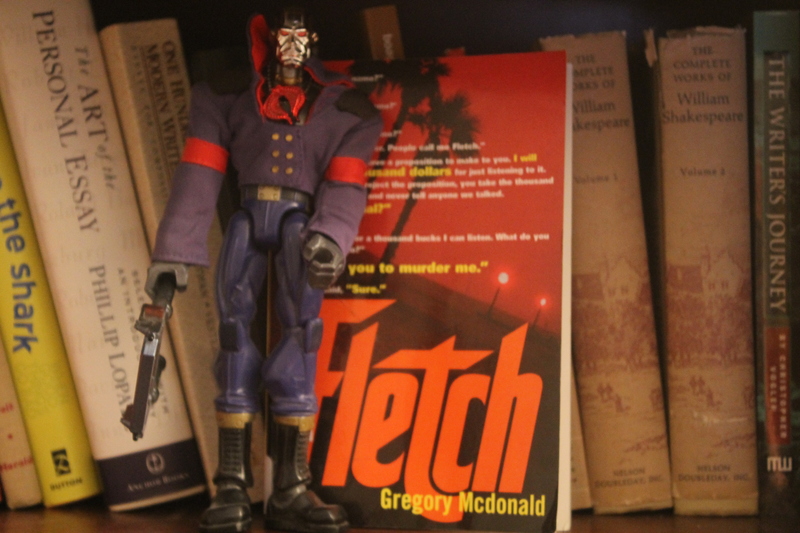 Note that while Fletch was McDonald’s first novel published introducing the Fletch character, he also published prequels, so Fletch is not the first novel in chronological order. McDonald was a newspaper reporter himself, so I imagine that he had an idea of the difficult life of a reporter that Fletch faced. It’s always interesting when authors write about environments they have personally experienced. I’m putting him next to Joseph Heller of Catch-22 fame as an author who can be funny and serious at the same time. As always, Bookshelf Battlers, thank you for stopping by. Shameless plug – please follow this blog, and if you’re on Twitter, follow @bookshelfbattle I’ll keep writing reviews as long as somebody keeps reading them. May your days be filled with booktastic goodness.